Lick Observatory has exciting news for everyone who enjoys astronomy, history, and the beautiful venue itself. The observatory is introducing a new format this season, a Public Evening Tour, which will enable more people to experience spectacular nighttime views of the observatory and its impressive line-up of telescopes, located at the summit of Mount Hamilton, elevation 4,200 feet, 20 miles east of San Jose. Due to the growing demand for telescope viewings at night for the general public, Lick Observatory has planned a monthly expert-guided tour of the observatory. Starting April 23, groups of up to 40 visitors will get to tour many of the domes and telescopes on Mount Hamilton. The "behind the scenes" style walking tour of Lick Observatory will start at the main building's Visitor Center at 6 p.m. An astronomer based on Mount Hamilton will be the main guide for the evening. Participants can learn about the unique history of the world’s first permanently occupied mountaintop observatory, the eccentric California pioneer James Lick, the technology used for observing on different telescopes along the tour route, and current science being conducted at Lick Observatory. Insights will be provided on how we find planets beyond our solar system, how exploding stars teach us about the evolution of the universe, how we discern the nature of galaxies and black holes, how new technologies are used to undo the blurring effects of Earth’s atmosphere, and about Lick Observatory’s rich astronomical history and bright scientific future. A highlight of the tour will be visiting the dome of the 3-meter Shane Telescope to see the mountain’s largest telescope up close. After the walking tour, there will be an opportunity to enjoy the sunset, and the Gift Shop will be open. During twilight, a history lecture about James Lick and the construction of the observatory will be presented. Once the sky is dark (and weather permitting), viewing celestial objects through the historic 36-inch Great Refractor telescope will commence. Complimentary coffee, tea, and hot chocolate are included with the tour. The event will last approximately 4 to 6 hours. For safety reasons and due to late hours, children under the age of 8 cannot participate; this event is recommended for ages 12 years and up. Visitors should be prepared to walk about one mile during the evening, including taking stairs. 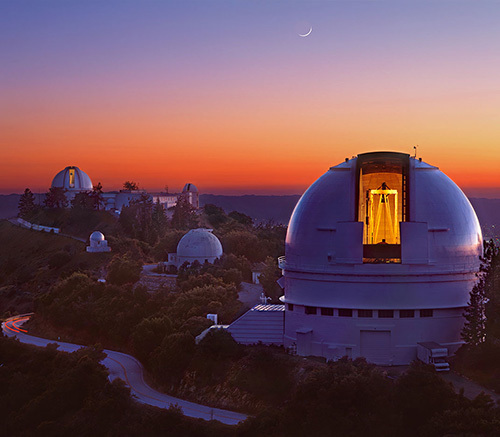 The schedule for Lick Observatory's other popular summer programs, "Evening with the Stars" and "Music of the Spheres," will be announced soon. Information is available online at www.ucolick.org/summer. Lick Observatory is located on the summit of Mt. Hamilton in the Diablo Range east of San Jose. Driving time from San Jose is about one hour via Quimby Road (lower Mount Hamilton Road CA-130 is currently closed due to a washout). Founded in 1888, Lick Observatory is at the forefront of astronomical research as an active research facility. It is operated by the University of California Observatories (UCO), a multi-campus research unit that serves eight UC campuses and is headquartered at UC Santa Cruz. More information is available online at www.ucolick.org.